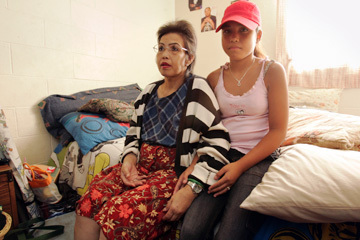 Josephine Wong and her daughter, Fritz Limon, 12, are to be evicted from their apartment in Kuhio Park Terrace for nonpayment of rent. Josephine Wong can barely move, sitting on the edge of the bed in her small, hot room. She is nearly incapacitated by lupus, too tired even to wipe a tear from her cheek as she eyes the belongings she has no way of packing up and will be unable to store when she and her 12-year-old daughter are evicted today from Kuhio Park Terrace, the state's largest federal housing project. "I told them I've been sick. My public assistance is too small," Wong said, her daughter's hand on her knee. "Right now, I don't know what we'll do." Wong and her daughter, whose monthly welfare subsidies total $575 a month, are more than $5,000 -- or about two years -- behind in their $315 monthly rent. With little money and no place to go, they face almost certain homelessness tonight. The two were evicted under a controversial new state policy aimed at cracking down on public-housing tenants who miss rent payments, which advocates say is hurting more than it helps. Under the program, evictions -- the bulk of which are for rent nonpayment or balances -- are sped up, and tenants have to move out while they are waiting for the results of an appeal in court. The policy is based on Act 227, which was passed by the state Legislature in 2002 and did away with an administrative appeals process for public-housing evictions. The state housing agency started to implement the law in 2005 and has asked that lawmakers repeal a sunset clause for the measure, which is set to expire in 2007. Under the new policy, the number of public-housing evictions in 2005 jumped to 167, from 70 in 2003, according to state statistics. Eighty percent of the evictions last year were for rent nonpayment, a report to the state Legislature says. A breakdown for 2003 and statistics for 2004 were not immediately available. The Housing and Community Development Corporation of Hawaii, which manages 5,363 federally funded public-housing units statewide, adopted the new policy after being scrutinized for allowing dozens of tenants to go years without paying rent. Some of those evicted last year owed as much as $15,000, housing advocates have said. "If you don't collect for so many months and years, it's no longer the tenant's responsibility. You failed to collect," said Sisan Suda, a member of Island Tenants on the Rise. He also said many of those in public housing, like Wong, do not speak English well and have trouble understanding the new eviction process or representing themselves to the eviction board. The group has introduced a bill in the state Legislature that would re-enact an administrative appeal process, allowing tenants to get a second opinion on the eviction board's decision. It would also lengthen the amount of time tenants have between when they receive an eviction notice and when they have to move out, and require that tenants be at least two consecutive months behind in rent before an eviction process can be started. Under the new policy, tenants have 10 days to leave after the eviction board decides against them. Stephanie Aveiro, executive director of HCDCH, said the new eviction process was necessary to remove the agency's "troubled" status under federal guidelines, and has helped tenants realize that public housing is not supposed to be free. "We don't evict lightly," Aveiro said. "We do it because we are responsible for the people who are abiding by the lease. They (tenants) have to abide by the lease, and they have to pay rent." She also said administrative appeals dragged out evictions for close to two years. According to her January report to lawmakers, evictions took an average of 18 months to complete when tenants were allowed to appeal to the agency and state Circuit Court while staying in their unit. Under the new policy, evictions take about 12 months, the report said. It also said 15 tenants averted eviction when they were given 10 days to "cure their violations." And, Aveiro said, public-housing managers have worked harder to resolve rent delinquencies before they become overwhelming for tenants. In the agency's Management Unit 3, which includes Mayor Wright Homes, Kaahumanu Homes and Kamehameha Homes, 830 delinquent tenants were able to work out past-due rent payment plans with managers, according to the report to lawmakers. "Once they miss a payment, we have to be on them immediately," Aveiro said, adding that managers get a monthly list of tenants who failed to pay rent so the balances can be discussed before they get worse. "We need to work quicker than later." Aveiro also defended the agency's decision to evict tenants before an appeal is made. She said tenants who were on appeal often destroyed their homes, adding to the department's number of apartments in need of overhaul repairs. They also failed to pay rent, she said. But housing advocates say the agency has left tenants without any real appeals process and is contributing to the state's homeless problem, throwing people into a tight rental market without providing them with any support or services. Aveiro said the agency is working to provide evicted tenants with more resources and referrals, but added that case managers are already bogged down with other matters and the department's funding is limited. As she propped her swollen feet on a plastic stool yesterday, Wong said her welfare subsidy barely covered her bills and medications, much less her rent. Six months ago the 51-year-old stood in front of an eviction board for two hours, trying to convince them that she would try harder to make her rent payments. They let her stay for the holidays -- the housing agency's policy. Then, three weeks ago, she got her eviction notice and was threatened with arrest if she was not gone by this morning. "I was so sad," said Wong, a slight woman who immigrated to the United States in 1980 and moved into Kuhio Park Terrace in 2000. The locks on Wong's unit, along with those of at least one other Kuhio Park Terrace tenant, will be changed at 9 a.m. today. As she went through her bills yesterday, stashed in an old magazine in her room, Wong came across a doctor's note attesting to her disease. She asked her Waipahu physician to write the letter in January, hoping it would convince her manager to reconsider the eviction. She took out the note slowly -- her hands not wanting to work -- and read it with disbelief. She was sure, she said, it would allow them to stay a little longer. Now she is trying to scout out her options. Wong's friend, a member of Island Tenants on the Rise, called the Institute for Human Services this week to see if they had space for the two, and was told there is a six- to eight-month wait for families to get in. If Wong goes into the women's shelter, signing up for a daily lottery to sleep in the nonprofit's garage, her daughter would have to go into the state's care. "No, no, no," Wong says at the suggestion, her voice cracking. "I'll stay with my baby."